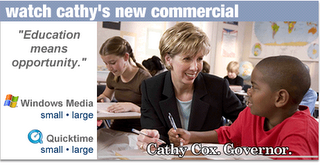 Cathy's second ad began airing in the Atlanta market today and will go up in other areas of the state next week. Click here to hear what Cathy has to say about education. In the first commercial, I liked the fact that Cathy actually spoke to the voters, (neither Taylor or Perdue speak in commercials to date), but this is by far the better spot. Take a look. Cox,Taylor, Perdue: Minding (Whose) Business? Why Does Mark Taylor Own Wal-Mart Stock? How Can Mark Taylor Relate to "The Little Guy"? Can Democrats Win in Georgia? Cathy Cox Takes it to the Street! Kia Go or No-Go? Who Knows? Perdue Ad "Beyond Stretching the Truth"
White House of Cards: Rove Indicted? What Has Sonny Done Now??? How 's Zell Going to Sell This? Why Do We Do This to Families? Did This Not Occur to Mark Taylor? "Zigzag Zell" and "Switcharoo Perdue"